Every functional business needs to maintain books of accounts and needs to comply with statutory regulations in terms of tax payments and filing timely returns. Paysquare offers you Accounting & Book-keeping services so that you can focus on your core business. We take care of all your accounting entries, tax compliances, vendor payments, bank reconciliation, employee re-imbursements and provide you with detailed MIS reports, as and when needed. Accounting of employee expense reimbursements. Fixed assets accounting, maintaining register of Fixed Assets. Financial and Operating MIS reports. Preparation of financial reports including Balance Sheet, Profit and Loss Account, Receivables and Payables Statements with age analysis. Operating MIS reports tracking relevant parameters as per your requirements. Tax compliances: Proper accounting of transactions in compliance with requirements of tax deduction at source (TDS). General ledger report for each month end. Monthly MIS report, report of employee reimbursements. Entries for PF / PT / TDS/ ESIC/ LWF and other specific provisions require d at year end. In a Company, a record of all financial transactions needs to be properly maintained and reported. An organized manner, in which all these debit and credit entries are recorded is called Accounting services. The first part is to make an entry of all these transactions, which is also called book-keeping. The second part is to understand what needs to be booked as an expense, and what needs to be considered as depreciation under the applicable regulations. At periodic frequencies, multiple reports are generated, which show the health of the business, cash flows etc, so that the management can be clear about the directions of the company. Entries for PF / PT / TDS/ ESIC/ LWF and other specific provisions required at year end. Achieving High level of accuracy. WHY WE NEED TO OUTSOURCE ACCOUNTING SERVICES? Accounting and book-keeping services are a vital component of operations for any business. It is important that this data is maintained accurately and on time. Besides, it is very essential to stay close and updated about the changing tax regulations. Any errors or delays in completing accounting related work and related compliances can result in the company being penalized or being pulled by the regulators. It is best to outsource accounting services to someone who has good domain knowledge about the same. They bring in expertise and experience and ensure that all the necessary regulations, as applicable for your company are being complied with, on time. WHAT PAYSQUARE IS OFFERING TO THEIR CLIENTS IN TERMS OF ACCOUNTING SERVICES? 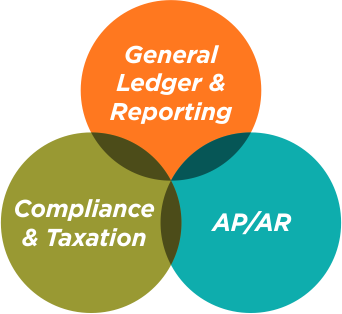 Paysquare isproviding end to end accounting services to small, medium and large sized businesses. Right from book-keeping to managing detailed accounting MIS, paying vendors, bank reconciliations, financial consolidations, Paysquare does all of it. Paysquare has the necessary expertise and experience to provide top end accounting services to clients. With Paysquare managing end to end accounting services, clients do not need to worry about their accounting services at all. With a combination of technology and best practices, Paysquare provides practical and timely assistance in a professional manner.